365-Day Calendar – These calendars typically fit on a desktop and have one small page for each day of the year. There are a variety of themed calendars to choose from, making it easy to choose one based on your colleagues interests and hobbies. For example, each day may have a new inspirational quote, recipe, high-heel shoe, or photograph of a travel destination depending on the calendar theme. Gift Cards – Everyone loves Starbucks gift cards, right? Gift cards are great for new co-workers or folks in the office you don’t know personally. Go with the popular coffee shops and restaurants around your office to make it that much more convenient for your co-worker. 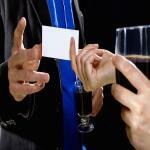 Plus, gift cards are easy to sneak into the company event venue without anyone noticing. Candy / Baked Goods – If you like to bake then whip up a few batches of your favorite sweet treat, wrap it in colorful cellophane and ribbons, and you’ve just saved a ton of money on holiday shopping for all your coworkers! Try a different alternative to the norm to spice it up, too. For example, try making Captain Crunch krispy treats or chocolate and Fruity Pebbles krispy treats instead of regular rice krispy treats. Personalized USB Flash Drive – Many companies sell personalized USB flash drives that can be engraved with a person’s name, logo, and more information. There are typically a variety of styles and sizes to choose from as well. This gift is sure to make anyone at the event happy since it is not only useful for the office but also shows you care by the personalized touch. Picture Frames – Most people love to print photos of their loved ones to frame and place around their work area. If you are an arts-and-crafts type of person, you can make this gift idea even more economical by going to your local crafts store, buying the supplies, creating and decorating the frames yourself. Desktop Fan or Air Conditioner – Does your colleague constantly complain that the office is like a sauna with no air circulation? Consider buying him or her a personal desktop fan or air conditioner. This will be a joy to give at your company event as it is both practical and inexpensive. If your company and the event location are in a cold area like Boston, consider buying a desktop heater instead! No matter what you decide to get your colleagues, make sure you wrap the gifts nicely and write a personalized card to go along with them. Try to make note of the gifts you receive at the event as well so you can follow up with Thank You cards. What types of gifts have you given your colleagues or been given by your colleagues? Let us know on Facebook, Twitter, or by leaving a comment below!